For the final part in the Where’s Willy series we’re going to look at the impact of the ice age and glaciation on the landscapes and geology of Wales. After the geological events and variability in palaeogeography that we’ve seen in the last few posts we’re now moving to the ‘recent past’ as it’s described by geologists of the last 500,000 years (ok, not that recent…) and the ice ages of the Pleistocene period. To investigate these icy behemoths, we are following William Smith to a glaciated landscape in Wales…. 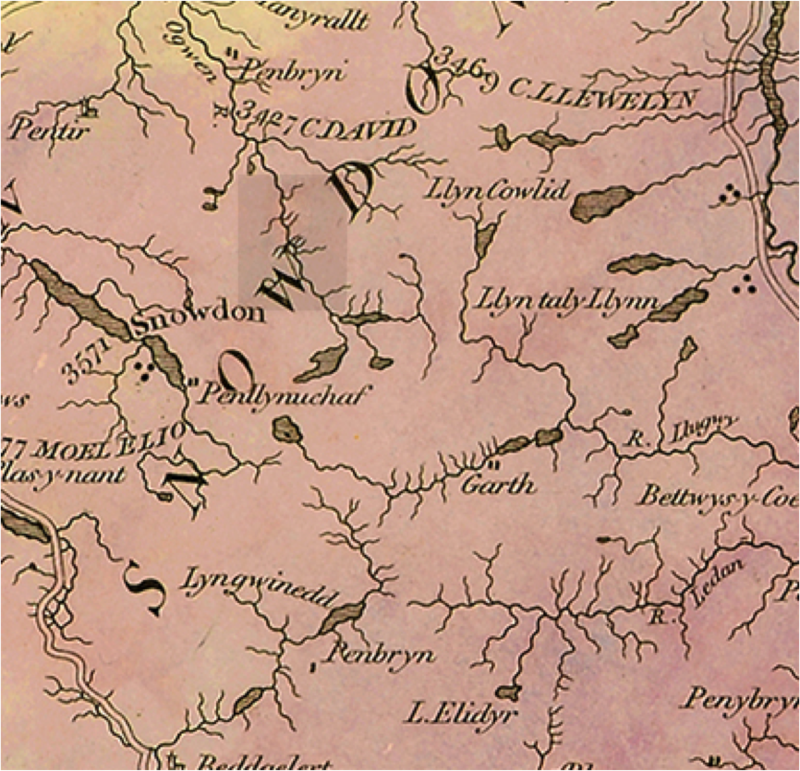 The Snowdon section of William Smith’s famous map of 1815. Can you spot William hiding in the map? That’s right, we’re going back to North Wales – to Cwm Idwal in Snowdonia to look at the impacts of glaciation on one of our most famous natural landscapes. Throughout the late Pleistocene (2.6 million years to 11.7 thousand yrs ago), continents were in much the same position as they are today (having drifted north since the break up of Pangea) and global temperatures were about 5 degrees cooler than they are today. Glaciers extended and retreated across the northern parts of the UK a number of times. Scientists think there were at least 20 cycles of glacial advance and retreat during the ice ages. Environments were also much drier because the majority of water was locked up in these giant ice sheets, meaning that desert-like conditions prevailed in southern areas beyond the glacial extent and dust storms were much more common. Much of Britain was covered by ice during several “Ice Ages” over the last 500,000 years. The most recent one ended only 10,000 years ago and the maximum extent of the last period of glaciation (20,000 years ago) reached all the way to South Wales and northern England (see image below). 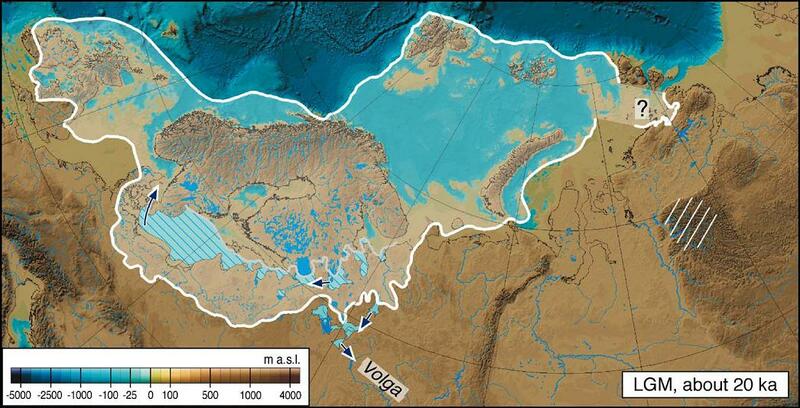 A map showing the late glacial maximum in Eurasia ~20,000 years ago. You can see that glaciers reached South Wales, Ireland and central England at their greatest extent. Image courtesy of Jan Mangerud, Wikimedia Commons. During this time, glaciers and ice sheets scoured the landscape, wearing away the rocks to form famous glacial landscapes in the Scottish Highlands, Lake District and N. Wales. In the coldest periods, the ice would have been hundreds of metres thick, and reached as far south as London. Cwm Idwal is just one of many glaciated landscapes that shows evidence of scouring and carving by glaciers as well as the uprooting and re-deposition of large rocks and boulders. To the human eye, glaciers look like static objects, but over geological timescales they behave like a fluid and flow across landscapes. They move very slowly and can grow and shrink under changing climates. In periods of high snowfall they will grow and when the temperature rises they will melt or break up to form icebergs. The action of the ice on the underlying rock can carve and sculpt the landscape and leave characteristic patterns and features. We can see examples of two of these at Cwm Idwal. Firstly, the word Cwm takes its meaning from the word cirque which is a geological term meaning ‘a half-open steep-sided hollow at the head of a valley or on a mountainside, formed by glacial erosion’. The rocks at Cwm Idwal (mostly volcanic rocks formed over 400 million years ago) have been eroded and carved by the presence of glaciers to form a deep bowl shape (see image below). Corrie Lake at Cwm Idwal. Image courtesy of Wikimedia Commons. This is now known to be a classic example of a glaciated landscape. In addition to the cirque we also see the presence of glacial erratics – pieces of rock that differ in size and type from those surrounding them, that have been left behind by retreating glaciers. 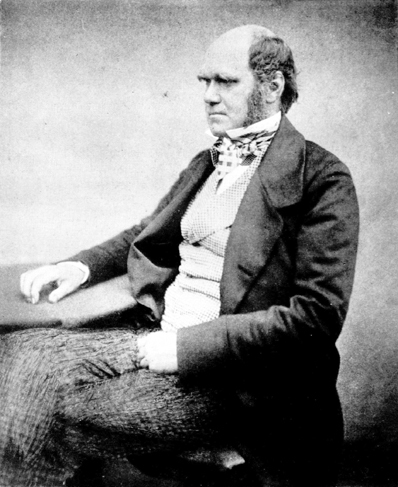 Portrait Charles Darwin, Aged 51. Image courtesy of Wikimedia Commons. Idwal a couple of times in during his life. He observed that the large, scattered boulders (now known as erratics) at Llyn Idwal (the lake) contained marine seashells. He realised that the rocks must have formed within an ancient ocean, and therefore had been later uplifted to the surface by forces within the Earth’s crust and transported to this site, sitting on top of volcanic rocks. Darwin later returned to the area, and made a further observation- that the beautiful landscape of Cwm Idwal was shaped by glaciers, at a time when Wales was far colder than it is today. The heather-covered hummocky mounds observed at Cwm Idwal are further evidence of a glacial past- as the glaciers began to melt and retreat around 10,000 years ago, they laid down the rocky material within them to form hummocky ‘moraine’ deposits. Tags: 100geosites, advent calendar, climate change, Cwm Idwal, Darwin, geography, geology, glaciation, history, Ice, maps, volcanoes, Wales, William Smith. Bookmark the permalink.